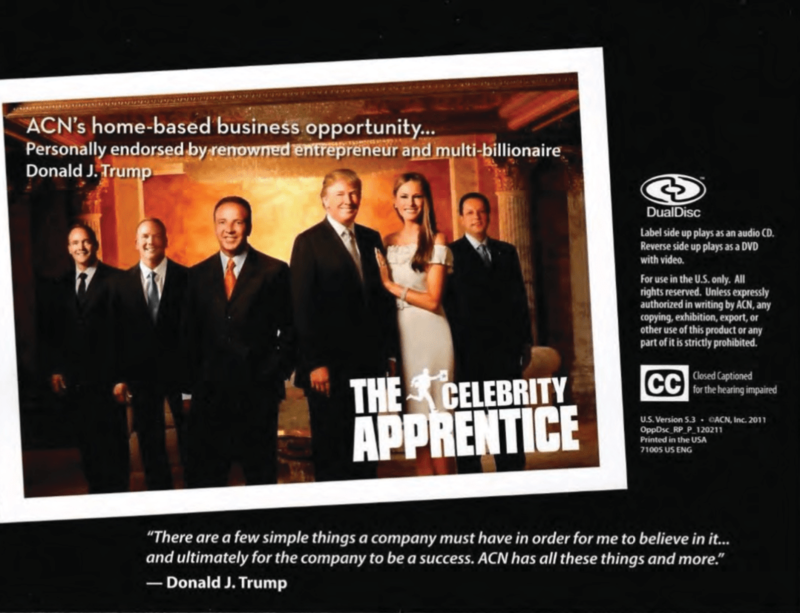 MANHATTAN (CN) – Four people rooked into a multilevel marketing scheme brought a federal class action Monday against the Trump Corporation, saying the president and three of his children made millions off a deliberate fraud. One of numerous pictures used in an Oct. 29 lawsuit to demonstrate President Donald Trump’s ties to the multilevel marketing company Advanced Communications Network. Represented by attorneys at Kaplan Hecker & Fink, the lead plaintiffs filed their 164-page doorstopper anonymously this morning in New York’s Southern District. Donald Trump began distancing distancing himself from the company American Communications Network in 2015 — when he became the Republican frontrunner in the presidential election — but the complaint painstakingly recounts 10 years of endorsements that the former reality star made for ACN before their previously undisclosed financial ties came to light. While Trump claimed in 2015 to “know nothing about the company,” the lead plaintiffs say his endorsement was key to why they went against their better judgment and sank thousands of dollars into the business. Contrary to his 2015 about-face, the complaint quotes Trump as having boasted over the years about the tremendous research he did into ACN. He denied that ACN was paying for his endorsement, saying he was too rich to need their money. “Not a word of this was true,” the complaint states. As for the president’s undisclosed personal relationships with ACN, the complaint notes that ACN co-founder Robert Stevanovski bought several properties near Trump National Golf Club in Mooresville, N.C. Even after Trump disavowed ACN in 2015, however, the complaint says their ties remain intact. 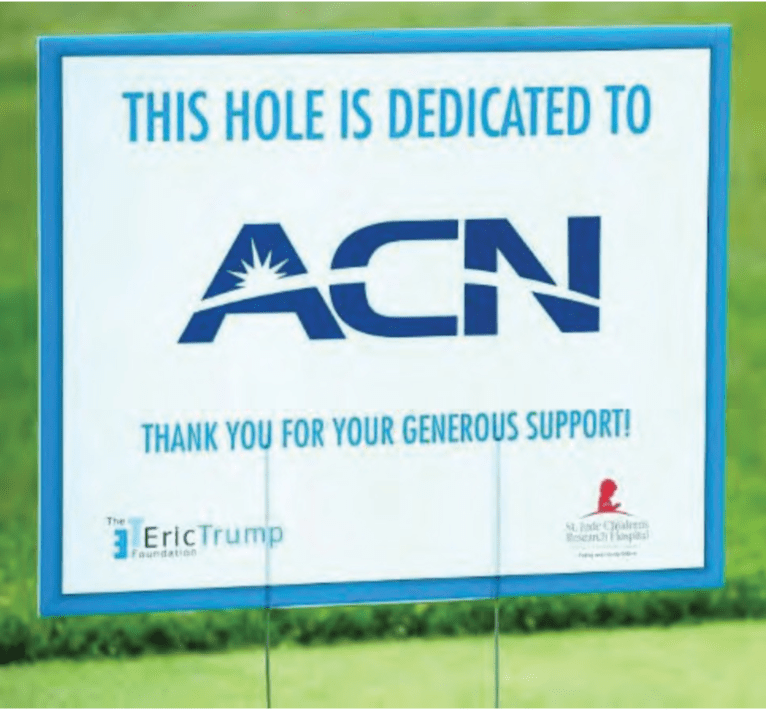 Just last year, in addition to sponsoring a hole at the annual golf tournament for the Eric Trump Foundation known as Curetivity, ACN held a celebrity golf tournament at Trump National Golf Club in Moorseville. In addition to the president and the Trump Organization, the complaint names Donald Trump Jr., Eric Trump and Ivanka Trump as co-defendants. One of the plaintiff investors is a California hospice caregiver. Others include a Californian who worked for the Salvation Army and a Maryland food delivery driver. They say it cost $499 just to register with ACN, followed by with a yearly renewal fee of $149. The company promised independent business owners that they could reap commissions by billing customers buying ACN products and services, most of whom were sold to at small events at hotels or event spaces, as well as by recruiting new business owners. These events were treated as “motivational rallies, designed to stoke enthusiasm and convince [potential investors] that they can make a profit if they just keep investing,” the complaint states. The class says Trump misled investors as to ACN’s risk profile, downplaying the low payouts to investors in those videos and during several conventions worldwide. Over the years, according to the complaint, investigations by regulators in Montana and elsewhere have found that ACN investors made back less than 10 percent of the amount they invested. Further, some regulators have noted that ACN purposefully excluded the expenses of nonactive business owners from calculating gross earnings, the suit alleges. The class says Trump allegedly boosted two other companies — The Trump Network, another marketing group, and live-seminar program Business Strategies Group — to the detriment of the unnamed investors. In the case of The Trump Network, which was set up to sell an array of diet supplements and vitamins, investors allegedly were similarly recruited to find new investors and customers and were charged hundred of dollars for introductory marketing materials. “The Trumps conned each of these victims into giving up hundreds or thousands of dollars — losses that many experienced as devastating and life-altering,” the complaint states. Seeking punitive damages and an injunction, the lawsuit alleges violations of federal anti-racketeering law, false advertising, fraud and negligent misrepresentation. A representative for the Trump Organization did not immediately respond to an email seeking comment. The lawsuit is the latest in a barrage of litigation against the Trump Organization. Earlier this summer a lawsuit accusing the Trump Foundation of fraud and self-dealing was filed by the New York attorney general.